14. Fred SCHMIDT was born on 22 Jan 1854 in Germany. He died on 2 Oct 1904 in Nunda, McHenry, Illinois. He was buried on 4 Oct 1904 in Nunda, McHenry, Illinois. The Tailor. Came to USA 1871. Listed in 1900 census in Nunda township. Owned a home free of mortgage. Fred Schmidt died at his home in Nunda, Ill. Sunday, Oct 2, 1904 after a lingering illness. His age being 50 years, 8 months and 10 days. Deceased was born in Germany, Jan 22, 1854. He came to this Country at the age of 18, and worked at the tailoring business both in Minnesota and the western states, attaining success in his vocation. 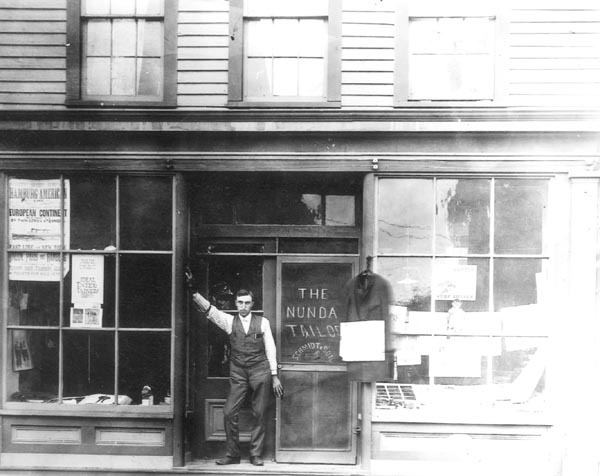 Before coming to Nunda to reside, in 1881, he lived in Genoa, Ill. His long residence in Nunda is well known and requires no comment. In 1874 he was united in marriage with the wife who preceded him across the dark river about two years ago. To the union were born seven children, two sons and one daughter dying in infancy, and William, Charles, Henry and Edith surviving and living at home in Nunda. There are also left two brothers - one in Germany and one in Genoa, Ill. and one sister, Mrs. Carl Burman of Nunda. Mr. Schmidt was an industrious man all his life, and was well liked by the friends who knew him best. Of late he had been a great sufferer from lung trouble. The community turns sympathetically toward the orphaned children in this, their sad bereavement. The Funeral was held from the M. E. Church in Nunda, Tuesday, Oct. 4, Rev. W. B. Doble, pastor officiating. The singing was by the church choir. Many beautiful floral tributes were lain upon the casket, and a large number of friends attended the final services. Interment was given in Union cemetery. The pall-bearers were: G. A. Piatt, E. J. Coquilette, J. W. Hartman, Henry Rowley, R. J. Wingate, R. Philp. He was married to Wilhelmine (Minnie) LIETZOW on 13 Jul 1874 in Elgin, Kane, Illinois. 15. Wilhelmine (Minnie) LIETZOW was born on 25 Apr 1852 in Calbonburg, West Prussia, Germany. She came to USA in 1873. She died on 4 Nov 1902 in Nunda, McHenry , Illinois. Mrs. Minnie Schmidt was born April 25, 1852, in Calbonburg, West Prussa, Germany. She died Nov. 4, 1902, in Nunda, Ill., aged 50 years, 6 months and 9 days. Mrs. Schmidt was the wife of Fred Schmidt, our merchant tailor. She lost her parents in Germany when she was quite young. At the age of 17 years she came along to this country. She was married in Elgin. With her companion she lived about eight years in Genoa, DeKalb County. Their home has been in Nunda about twenty-one years. She leaves one brother, Andrus Litzar, who resides in Genoa, DeKalb county. She Also leaves four children - Edith, William, Charley and Henry, besides her companion, to mourn their loss. The deceased lived a quiet, peaceful life. She was well-known to many of the people of this and neighboring communities, and held their hightest respect and esteem. She was a faithful wife and mother. The funeral was held at the Christian church, Friday, Rev. J. W. Bolton officiating, and the body was laid to rest in Union cemetery. She was buried in Crystal Lake, McHenry, Illinois. Union Cemetery. i. Fred SCHMIDT Jr was born about 1875 in Illinois according to the 1880 census. He may have died December 8, 1881 at the age of 6.
ii. 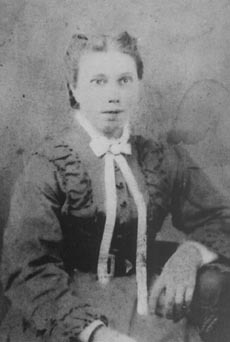 Minnie SCHMIDT was born about 1877 in Illinois according to the 1880 census. She may have died December 14, 1881 at the age of 4.
iii. Frank SCHMIDT was born about 1879 in Illinois. according to the 1880 census. He may have died December 16, 1881 at the age of 2.
iv. William SMITH was born in Oct 1881 in , , Illinois. He died on 9 Aug 1914 in Minneapolis, Hennepin , Minnesota. From the Crystal Lake Herald: Wm. Smith, a former resident of Crystal Lake, eldest son of Fred Smith, who conducted a tailoring establishment in this village for many years, died at Minneapolis, Minn., Aug. 9. He was well known in Crystal Lake and vicinity, being the eldest of three boys. Many friends will regret to learn of his demise, as he was extremely popular and well-liked by all who knew him. The Pecatonica News says: The many friends at this place of Wm. Smith, who about a year ago conducted a tailor shop in the Sarah Rogers building, on Main street, will regret to learn of his death, which occurred Sunday, Aug. 9, at Minneapolis, Minn. He resided at this place several years and made his home with T. J. Carpenter, the barber, and was a member of the Pecatonica city band, playing slide trombone. He was a genial good fellow and was liked by everybody. Mr. Smith contracted tuberculosis a short time after leaving Pecatonica, and although everything possible was done for him, they could not stay the ravages of the dread disease, which did its work so quickly. Note: Pecatonica Newspaper, Vol. 42, #42, p1, c6, Fri, Aug 21, 1914 Occupation also listed as tailor in 1900 census. SMITH, William of Rockford has decided to locate here and open a tailor shop in rear of T. J. Carpenter's barbershop and do cleaning, pressing and repairing. He is a member of our band, has spent much of his spare time here and already is quite well known. SMITH, William our tailor made a trip to Woodstock last Monday. SMITH, William. His brother, Henry, of Detroit, Mich, is now driving a 90-hourse power Olds-mobile car. SMITH, William the tailor, now occupies a part of A. W. Waterstreet's store room on Main St.
SMITH, William the tailor, leaves next Tues to spend holidays at St Paul and Minneapolis. SMITH, William the tailor expects to leave in a few weeks for Minneapolis to accept a position offered him there. Parties having pressing and repairing to be done should get their work in at once. SMITH, William the tailor, has decided not to leave for Minneapolis until sometime in the latter part of Feb.
SMITH, William the tailor, left last Sat for Minneapolis where he will spend sometime but expects later in the season to go to Aberdeen, Idaho to locate. SMITH, William who about a year ago conducted a tailor shop in the Sarah Rogers bldg on Main st., died Aug 9 at Minneapolis, Minn. Lived here several years and made his home with Tom Carpenter, the barber, and was a member of the Pecatonica City Band playing slide trombone. He contracted tuberculosis short time after leaving Pecatonica. Retired Pressman - Fiberboard Co.
Last address was 6220 S. E. Division, Portland, OR. vii. 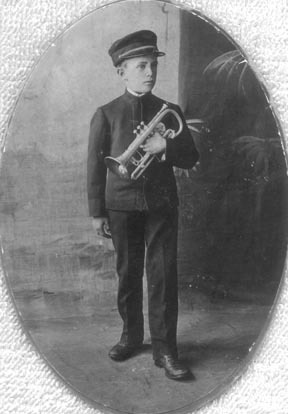 Henry A. SMITH was born on 14 Feb 1891 in Crystal Lake, McHenry , Illinois. He died on 5 Apr 1960 in Saginaw, Saginaw, Michigan. Died at Veterans Administration Hospital, Route 1, Rural Saginaw Township. He was buried on 8 Apr 1960 in Mio, Oscoda, Michigan. He served in the military 11-22-1917 to 4-16-1919 in England and France. Wagoner in 338th Cavlry, Hq Det, 169th Calvy Brig. Service Number - 202 5629. Oscoda County News, Mio, Michigan, April 14, 1960. Memorial Obituary - Henry A. Smith, 69, of Mio, died April 4, 1960 at the Veteran's Administration hospital in Saginaw after an illness of five months. A retired chauffeur, Smith was born February 14, 1891, at Crystal Lake, Ill. He was a veteran of W. W. I. He moved to Mio in 1936 from Trenton. He was a member of the Trenton Veteran of Foreign Wars Post 1888. Surviving are his wife, Nellie and a daughter, Mrs. Stanley Pierce, Grand Ledge. Services were held at 2 P. M. Friday, April 8 at the Larrison Funeral Home, Mio, with the Rev. Paul Jarvis officiating. Military graveside services were conducted at the Mio cemetery by Mio American Legion Post.